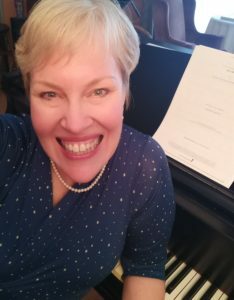 Ginger George performs sultry songs of the 30s, 40s and 50s with velvety vocals and a contagious smile, accompanied by Merry Jensen on keyboard and Joe-Henry McQuary on drums. The trio can be heard every fourth Friday at the Marquee Lounge on the second floor of the Kiggins Theatre, 1011 Main St., Vancouver. There is no cover charge. Food and beverages are available to purchase. 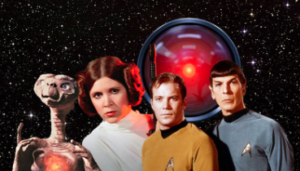 Journey to the Final Frontier through the music of "Star Trek," "Star Wars," "E.T.," "Close Encounters of the Third Kind," "2001: A Space Odyssey," and more with the Oregon Symphony's "Sci-Fi at the Pops" concert at 7:30 p.m. April 27 and 2 p.m. April 28 at the Arlene Schnitzer Concert Hall, 1037 S.W. Broadway, Portland. Tickets are available at www.orsymphony.org/concerts-tickets/. North Clark Historical Museum, 21416 N.E. 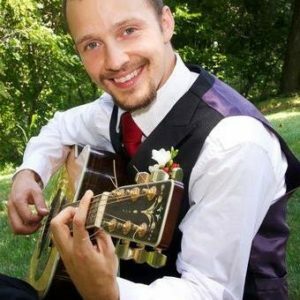 399th St.
Come to the basement room of the North Clark Historical Museum at 6 p.m. to sign up to perform, and the music starts at 7 p.m. Admission is free and donations are accepted; money collected benefits the North Clark Historical Museum. Refreshments will be served. East Woods Presbyterian Church, 16210 N.E. 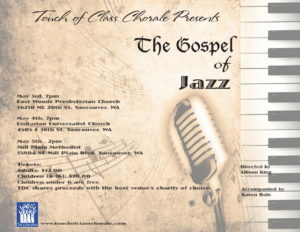 20th St.
Touch of Class Chorale presents “The Gospel of Jazz,” featuring jazz and gospel favorites such as “Sing, Sing, Sing,” “It Don’t Mean a Thing (If It Ain’t Got that Swing),” “All My Trials,” “Elijah Rock” and much more. Unitarian Universalist Church of Vancouver, 4505 E. 18th St.
Alberta Rose Theatre, 3000 N.E. Alberta St.
Siren Nation presents: "Lady Sings the Blues" — A Tribute to Billie Holiday, the 13th annual Billie Holiday tribute night, at 8 p.m. on Saturday, May 4, at Portland's Alberta Rose Theatre. This event brings together musicians of many genres to pay tribute to one of the greatest jazz singers and songwriters of our time. Tickets are $18 in advance or $20 at the door, and proceeds benefit the 2019 Siren Nation Festival. Buy tickets at www.albertarosetheatre.com. Mill Plain United Methodist Church, 15804 S.E. Mill Plain Blvd. Confluence Vineyards and Winery, 19111 N.W. 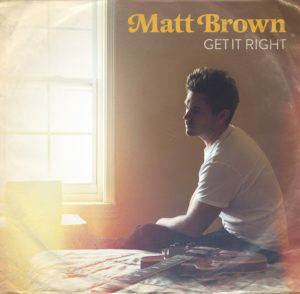 67th Ave.
Matt Brown will perform at Confluence Vineyards and Winery from 3 to 6 p.m. May 18. Tickets are $5 for members or $7 for non-members.